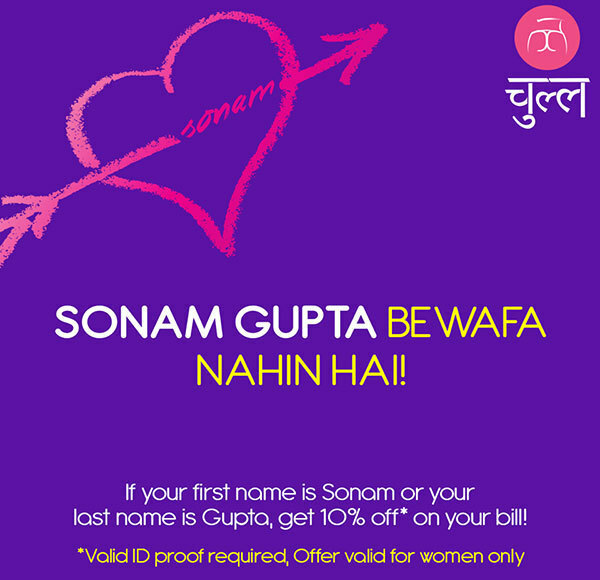 Bewafa or Not, All You Sonam Guptas Shouldn't Miss Out On These 8 Amazing Deals in Town! Like the internet hadn’t given Miss Sonam enough popularity, here’s some more ma’am! After all the fame that ‘Sonam Gupta’ has got or rather shame?! (#SonamGuptaBewafaaHai) it’s time something good happened her way! From free beers to buntas and desserts, there’s everything in line so will the real Sonam Gupta(s) please stand up! 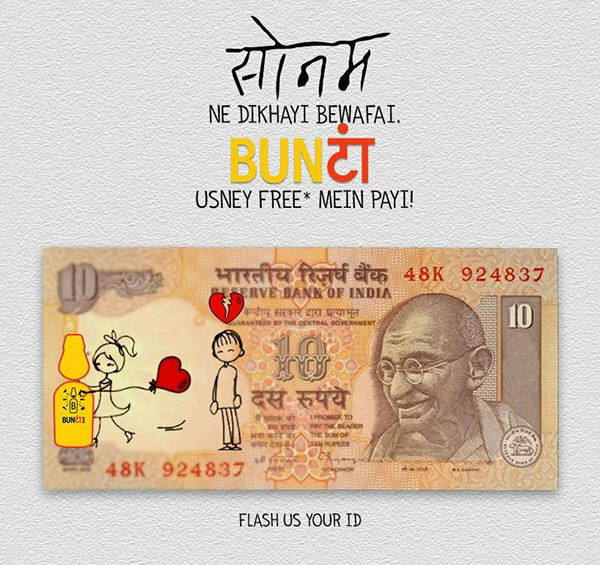 Bunta Bar in CP, known for its delicious alcoholic buntas is calling out to all Sonam Gupta’s to flash their ID and grab a free Bunta from the Buntastic Bar available here! We&apos;d recommend you to try Aam Panna Vodka and Namkeen Gupp. So all SG’s out there, go thank the original bewafa Sonam Gupta and glug away! The Beer Cafe too feels for Sonam Gupta and so is calling out to all the Sonam Gupta’s out there to come and avail a free cold beer at their outlet and share her side of the story perhaps!! 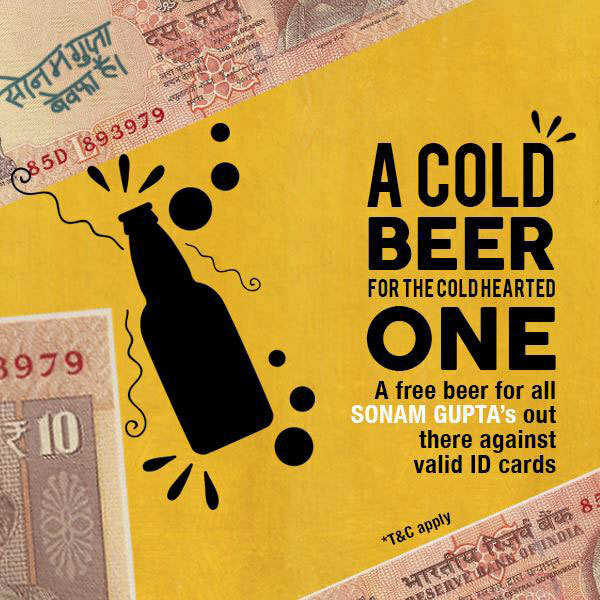 So if your name is Sonam Gupta and you have a valid ID to prove it, head on over and chug down a mug of free beer! These guys ain’t keeping it limited to Sonam Gupta, they’re okay if your name is just Sonam! 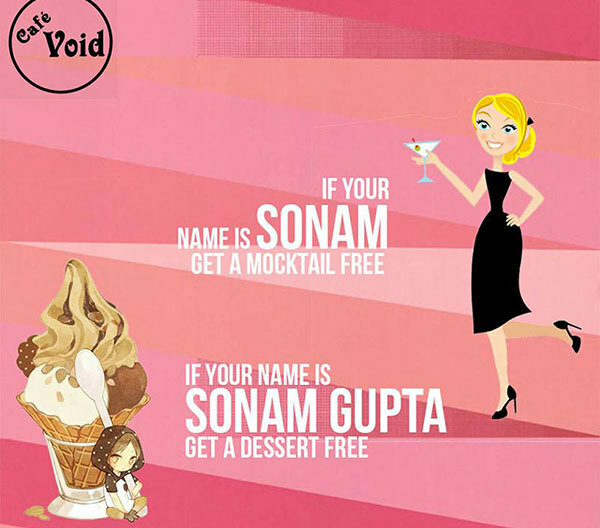 They&apos;ve giving away all Sonam’s a free mocktail but if you have the privilege of being called Sonam Gupta then you literally have the cherry on the cake with a free dessert too! Ain&apos;t that sweet?! Since everyones chatting about Sonam Gupta, The Chatter House joined in and are feeling quite generous! 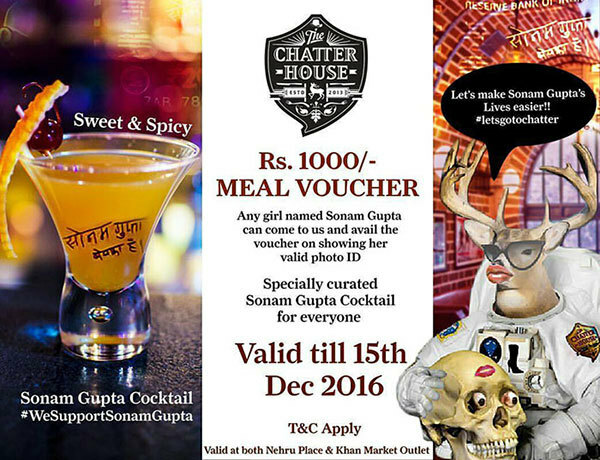 They’ve got a meal voucher worth Rs 1,000 for all Sonam Gupta’s out there *woah*! Just show &apos;em your ID and you’ll get a voucher for yourself - this deal&apos;s valid till 15th Dec! Also, for lesser mortals, they’re showcasing a specially curated Sonam Gupta cocktail on the menu for everyone! With a slogan that says, ‘One Love One Life, Bewafa Vibes’, our fav party place in HKV has a crazy deal awaiting all Sonam Gupta’s! 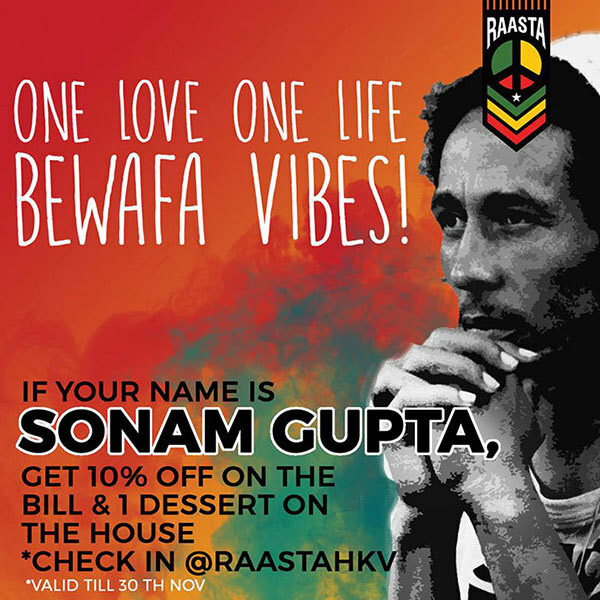 All you gotta do is check into Raasta and the name gets you a 10% off on the bill and a dessert on the house! YAS!! Hurry along cause this deal&apos;s on till 30th Nov. The newly launched cafe, Chull, is also taking part and they’ve got a 10% off for all those whose first name is Sonam or second name is Gupta! Yes unlike the other offers which are only for all mostly for *Sonam Gupta’s* this one is for those with just *Sonam* or *Gupta* either one in their name! Thoghtful eh! After all the beers and mocktails it’s time to enjoy some free gol gappe too Miss Sonam because Imly believes that Sonam Gupta Bewafa NAHIN hai (how sweet!) 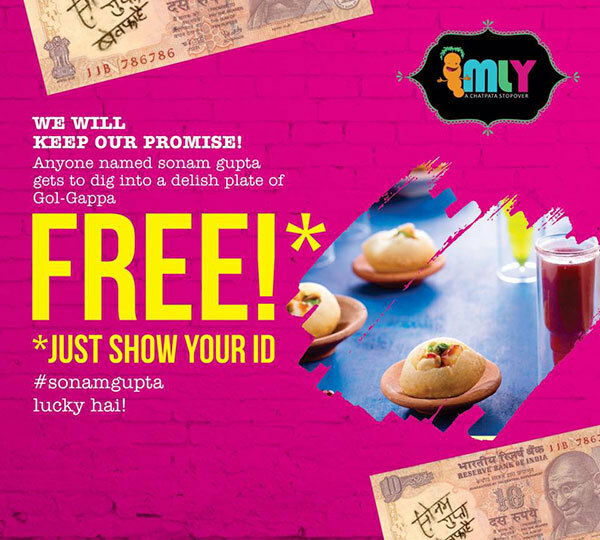 and so Imly is calling out to all Sonam Gupta’s to come and avail a free plate of gol gappe by just flashing their valid ID simply because #SonamGuptaLuckyHai. Let&apos;s put aside all the free food and drinks for now as Pet Fed has something different in line for all Sonam Gupta’s in town! 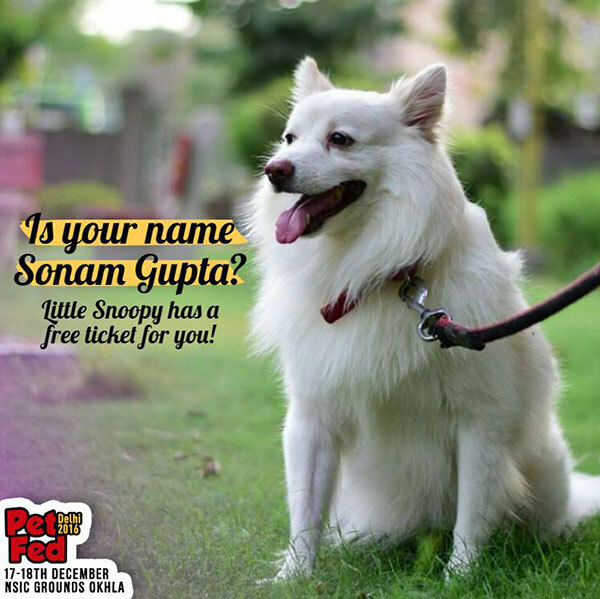 Little Snoopy doesn’t mind if you’re bewafa (aww), and what&apos;s more, he’s got a free ticket for you! Yes, carry your ID along and you can avail a free ticket to the upcoming Pet Fed event taking place on the 17th-18th Dec! Yes it’s true, after all the fame game that she’s got, Sonam Gupta is taking one for the team now! All you Sonam’s out there, go give your parents a tight hug will you and go rule the world!